If you are looking for a recipe for fudge brownies that uses dark chocolate and cocoa for deep intense flavor and fudgy texture with crisp sugar crust on top then you should try this recipe. Many people have loved my cocoa brownies and its still my to-go recipes but I was for very long been trying to try a truly fudge brownies. 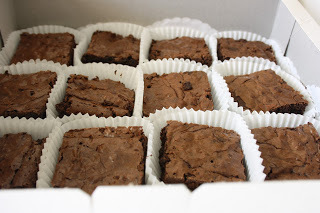 After searching alot, I short-listed two recipes, Fudge Brownies from Baked and King Arthur no fail recipe of Fudge Brownies, both looked really promising, had raving reviews and I want to try both but I started with Baked. It It is a bakery in NewYork and they have recipe books written by Matt Lewis featuring these brownies among many more recipes that are quite popular as well. 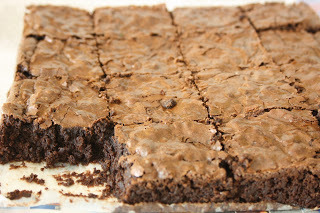 To add to the hype, these are Oprah’s favorite brownies as well. On the other hand King Arthur claims that they fudge brownies recipe is guaranteed. Interesting. But the King Arthur one had one negative review and it uses chocolate chips and a little tedious method so I preferred Baked over KA. For now I am settling down on these since no doubt they are amazing. 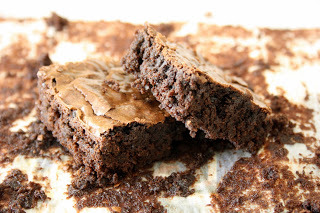 Fudgy, intensely chocolaty, moist, crisp crust and dense. Don’t overmix or overbake otherwise the results can vary alot. Let me know if you try it and how they turned out for you. If you have already tried them, do you think they are the best. When I saw the same recipe at Smitten Kitchen, I knew they would be amazing. But I was looking to make a smaller batch. So I found a nice halved recipe here. 2. Butter a 8-by-8 inch pan, line with baking parchment paper, and butter the paper as well. 3. Sift together the dry ingredients: flour and cocoa powder. 4. On medium-low heat, melt the butter in a heat-proof bowl over a pot of simmering water. Stir until the butter has melted completely. Add the espresso powder and chocolate. Once the chocolate is melted and incorporated, remove from heat, add vanilla, and let cool. 5. Meanwhile, using a whisk beat together by hand or with a mixer fitted with the whisk attachment, the eggs, both sugars, and salt until light and frothy. 6. Fold the mixture into the cooled chocolate. 7. Add the sifted dry ingredients and fold until just combined. Do not over mix. 8. Spread batter in prepared pan and smooth top. 9. Bake the brownies for 30 minutes or until a toothpick inserted into the center comes out with a few crumbs. – If the toothpick comes out clean, the brownies will end up being over baked. – Let cool completely before cutting the brownies. 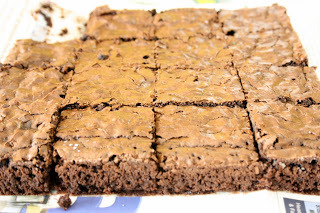 – Use the parchment paper to lift the cooled brownies onto a cutting board. – Cut with a serrated knife that has been run under hot water; do so after every cut. 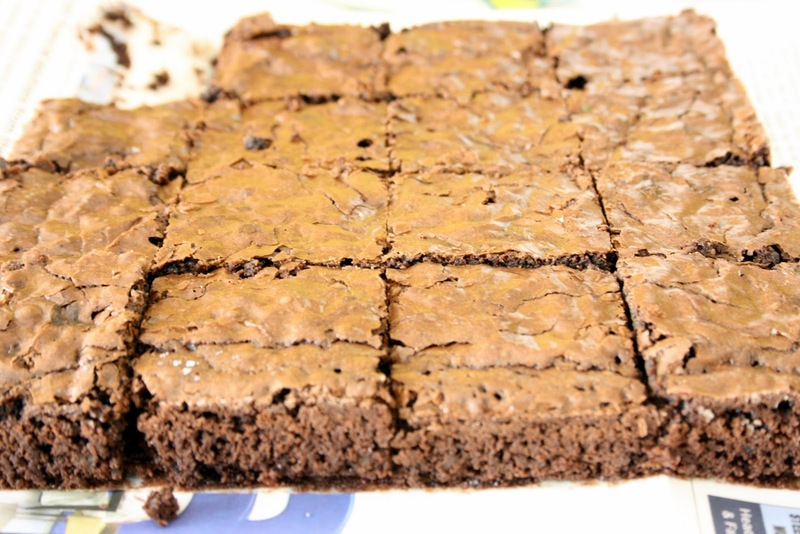 Mouth watering…I always love brownies and the crust you have on yours in very tempting… must go for…. I’m impressed, I have to say. Your weblog is educative and entertaining. Thank you for sharing, looks amazing!